Austin Resource Recovery provides cart-based trash and recycling collection services for some small businesses in residential areas that do not require dumpsters. Most businesses, however, choose a private hauler for their landfill trash, recycling or composting services. Additionally, Austin Resource Recovery manages a commercial trash and recycling contract for businesses located in the Downtown Austin Service District. 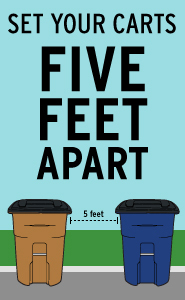 Set up new trash and recycling services at the same time you open new electricity and water accounts by calling 512-494-9400 or by visiting Online Customer Care. View Residential Curbside Collection Schedules to find your trash and recycling schedules.